Barbara Lee leads a bipartisan group that funds research on women’s campaigns and a political one that backs liberal female candidates. Barbara Lee had a life-changing realization five decades ago as a student at Simmons College, where the undergraduate program is women only. “For the first time ever, I saw women being the leaders — being the president of the class, and the president of the student body, and the editor of the paper,” Lee, 69, recalled in an interview at her Cambridge office. For nearly 20 years, Lee has made it her job to ensure that others see women’s leadership potential. If 2014 is the year of the woman in Massachusetts politics, with female candidates likely to claim four of six statewide offices in November, it is due in no small part to Lee’s efforts. 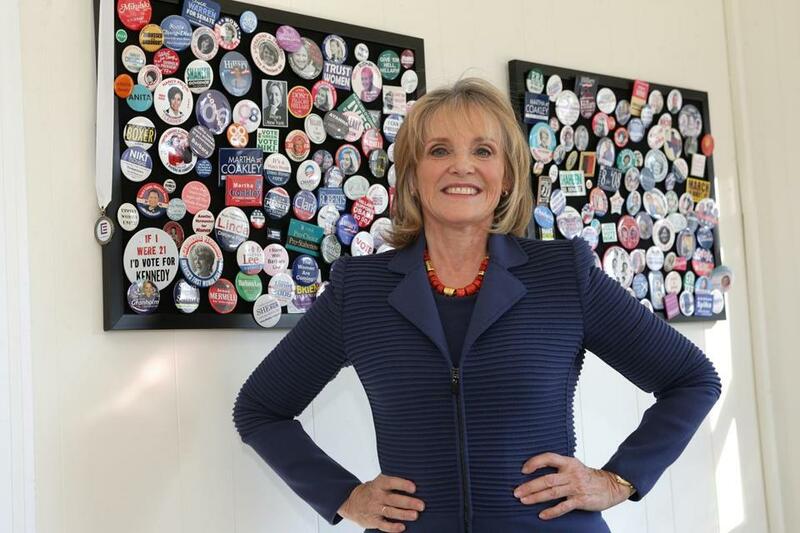 Her bipartisan Barbara Lee Family Foundation funds research on women’s campaigns and shares its findings with female candidates of all political stripes, while her Barbara Lee Political Office funds and advises female candidates who share her personal values, generally pro-choice Democrats. Coakley says Lee has a gift for spotting potential candidates and helping them build networks of support, and that she is tireless in raising money and offering encouragement. Lee, who splits her time between homes in Cambridge and Chilmark, also backs Massachusetts Democrats Maura Healey for attorney general, Deborah Goldberg for treasurer, and Suzanne Bump, the incumbent auditor. She and Healey first met at a Democratic event a decade ago, when Healey was an attorney at the State Street firm WilmerHale. The two saw each other at Democratic events over the years but didn’t discuss a possible run again until last fall, Healey said, when she told Lee she planned to run for attorney general. Lee threw her support behind Healey and in March signed on to cochair her campaign’s Women’s Steering Committee. Healey said Lee’s support, along with that of organizations such as Planned Parenthood and Emily’s List, which works to elect progressive female candidates, was important in her Democratic primary defeat of Warren Tolman, who had the backing of many in the party establishment. This fall, Lee also has her eye on the New Hampshire Senate race between incumbent Democrat Jeanne Shaheen and Coakley’s old foe Scott Brown, as well as Senate and gubernatorial races nationwide. Her ultimate goal is full equality for women, she said, and she convened a summit of powerful women in 1996 that concluded that electing women to high office was the means to accomplish it. The US presidency is the obvious brass ring, and Lee expects Hillary Rodham Clinton to be the first woman to grab it. Lee has known Clinton since she was first lady, when she encouraged Clinton to run for the US Senate and shared her first publication on electing women. Now Lee is a founding member of the political action committee Ready for Hillary. “I’m one of the many people encouraging her,” Lee said with a grin. She expects both parties to have women on their 2016 presidential tickets, even if both aren’t at the top. “What you do see is men trying to get support [from] women by having women as their running mate,” she said. Lee has her eye on the long game, though, and she won’t declare victory until the country elects its second female president. “When you elect two, we know that the culture has really changed,” she said. Lee said her passion for politics came from her grandmother, Minnie Greenberg, who shared memories of watching suffragists marching on New York’s Fifth Avenue before women gained the right to vote in 1920. Lee said Greenberg would “thrilled” to see the gains women have made in recent years and the role she has played. “I think she would just be so amazed and so proud of me for taking her interest and her passion and making it into my mission,” she said.